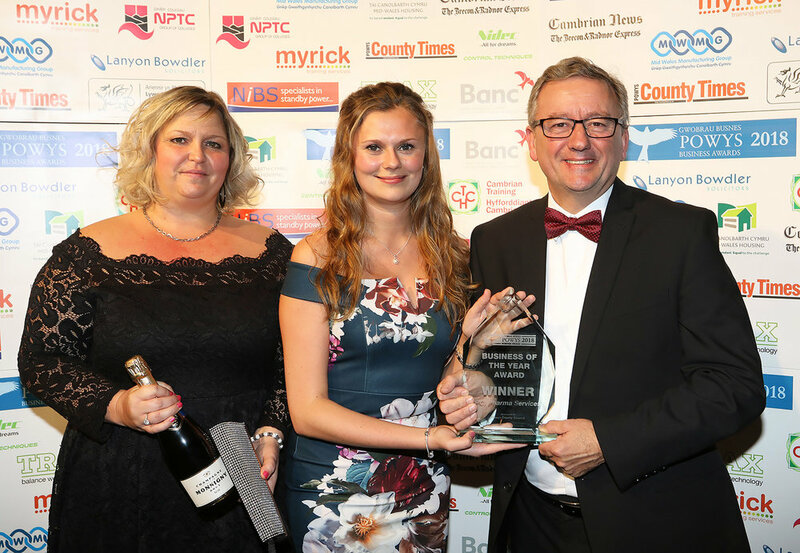 PCI Pharma Services was named Powys Business of the Year, sponsored by Powys County Council and collected the Outstanding Commitment to Training Award, sponsored by NiBS Ltd, at the annual awards dinner held at The Hafren, Newtown. During the last financial year, the PCI Hay facility completed more than 36,000 training hours, which equates to around 100 hours per person over the year. Turnover increased by 24% and profits by 88% over the last two financial years. Due to its rural location, the company experiences many challenges with recruitment. As such, its goal is to invest in developing staff from within the business, including two Qualified Persons (QPs) who are licenced to release drug product to market. Without the QPs, who take five years to qualify, the company could not operate. Four of six vacancies in the customer service team were filled by graduates and apprentices who were trained by the company. NVQ programmes at Levels 2 and 3 help to develop homegrown talent in the warehouse, production and engineering departments. The company has four staff in its training team, all of whom have completed a Level 3 qualification in Education and Training. Training is delivered at all levels of the company, from IT software and technical training to support incoming technologies to Leadership and Management programmes to underpin managers’ skills and support staff development. PCI Pharma Services’ training supervisor Tracey Lewis and account manager Paige Morgan receive the Outstanding Commitment to Training Award from Chris Gilliard of NiBS Ltd, sponsor. PCI Pharma Services’ training supervisor Tracey Lewis and account manager Paige Morgan receive the Powys Business of the Year Award from David Powell, of Powys County Council, sponsor.